Charlie Bears Bogart Discounts Apply ! 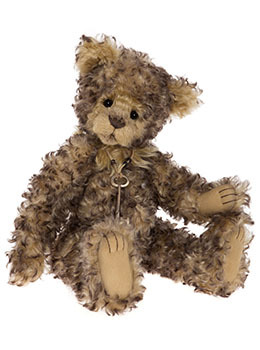 This nostalgic looking bear is fully jointed and has been created using a soft curled and tipped mohair in warm shades of honeycomb and deep chocolate brown. A preloved / repaired style nose embroidery has also been used to help create his look. Additional toe stitching has been added to his paws and his accessory kept simple with a Key to your heart pendant.